The above EADT report is of the Sizewell Stakeholder Group meeting on 5th December 2013,when your Chairman made yet another impassioned appeal for the ONR to insist that EDF, the operators of Sizewell B, carry out tests on the safety of the Sizewell B reactor pressure vessel, following flaws found in two Belgian and two American RPVs. Your Chairman demanded that tests be carried out now, or no later than 2014 at the next outage: no waiting until 2016, when the 10 year Periodic Safety Review is due to be held. We regret to say there was no response from the ONR representatives present despite being invited to so do by the SSG Chairman…. We have pursued our concerns yet again in a letter to HM Chief Inspector, ONR. We quote “The Belgian Federation for Nuclear Control IFANC] issued in November 2013 a single sheet link to FANC’s Final Report which ‘details three additional actions on top of the existing operational measures’ in order to allow the plants to restart These measures, as you will know, in view of the possibility of catastrophic failure of the RPVs severely limitthe thermal and pressure loadings during normal operations. Furthermore, ‘as an important remaining action, already discussed in the licensee Safety Case (1), the Licensee will perform the same UT-inspection of the entire reactor pressure vessels wall thickness at the end of the first cycle of both units’. 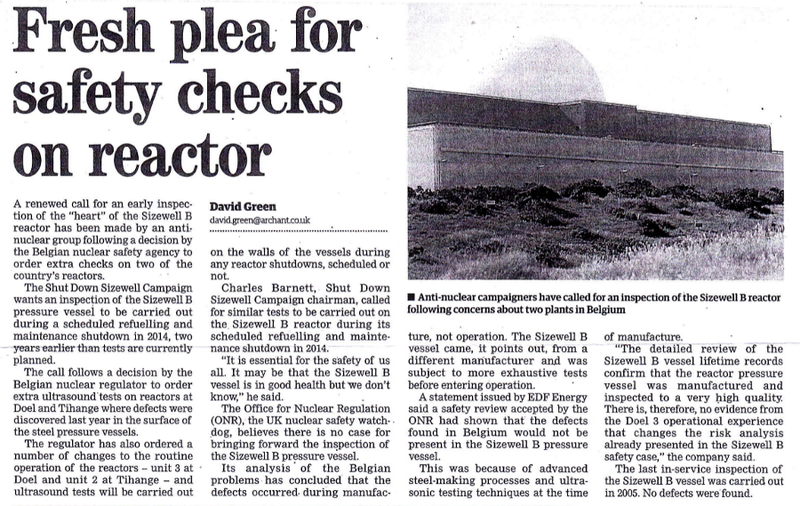 All this leads us to urge you (the ONR) to insist that EDF, the operators of Sizewell B, carry out the same whole body UT- inspection of Sizewell B’s RPV immediately, and certainly no later than the next Sizewell B outage, scheduled for late 2014. We are aware that UT tests of Sizewell B’s RPV were carried out in 2005; but we understand they were restricted to areas around the vessel’s welds and not the whole vessel’s wall thickness as now recognised by FANC for Doel 3 and Tihange 2 reactors. A vital difference.